Things have gone from bad to worse in Slaughter Gulch. Our once quiet little town has already been overrun once. Since they discovered the ghost rock there has been a constant struggle for control of the town. Unfortunately, it seems the mining has also attracted something else...Something EVIL! 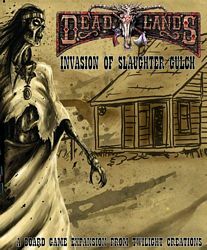 Deadlands: Invasion of Slaughter Gulch adds new elements to the board game of Weird West fun!